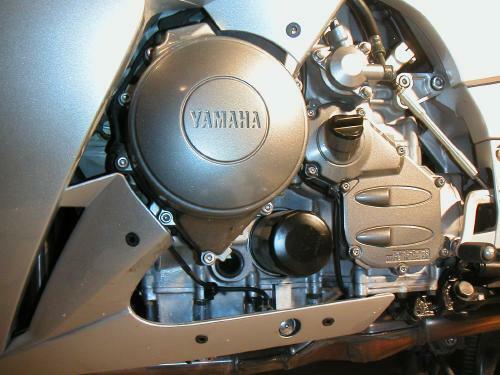 As of Fall, 2002, Yamaha USA has declined to import several of the special accessories they make for the FJR1300. 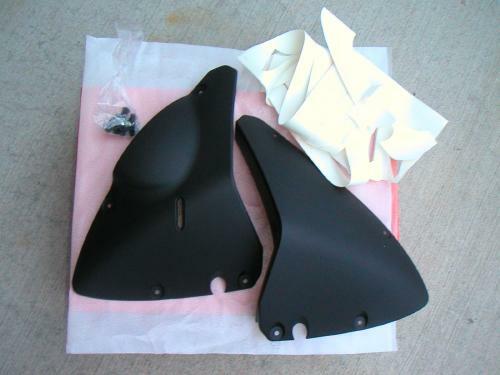 One of these is a "Foot Guard" (or foot shield) accessory that keeps the wind draft and rain off your feet when riding. 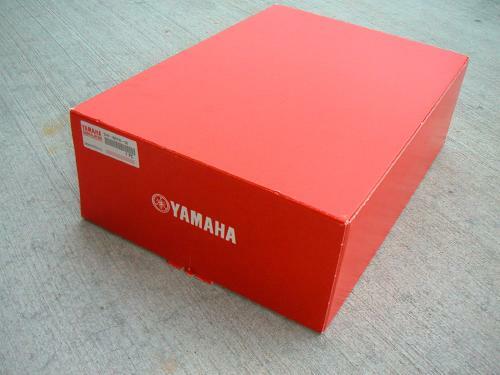 Fortunately, there are other ways to obtain such accessories -- buying them from Europe or Canada, or in my case, buying them locally from FJRGoodies.com, who shipped them to me (with a couple OEM Yamaha oil filters) in just 2 days. Here's the box they came in. FJRGoodies.com imported them from somewhere in the U.K., I believe. The part number on the box is: 5JW-W0745-00. Here's what is in the box. The two dark charcoal gray (some would say black) foot guards, the fasteners, and a set of temporary stick-on alignment decals. The tools I used. Two drills made it a little easier, as I used 4 different sized drill bits to work up to the 9.5mm final hole size which the directions call for (I used a 3/8" bit, which is only about 10 thousandths of an inch larger than 9.5mm). 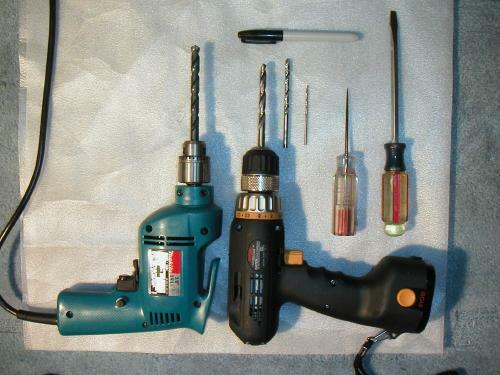 Actually, another friend pointed out that I should have used a "Uni-bit", a special stepped drill bit designed to put holes in thin stuff like fairing panels, dash panels, fiberglass, etc. So I went to Sears and bought the one shown in the photo above. I sure as hell wish I'd known about uni-bits before I did this install. I tried it on some scrap plastic panels, and it works like magic! 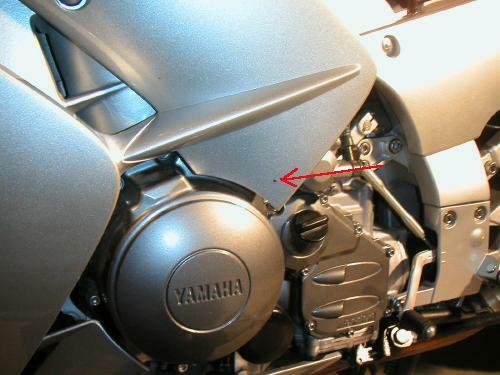 Another point that might be mentioned is about the "bracket fastener" and how it works i.e. as you screw the nut in, it causes the metal sleeve inside the fastner to rise up towards the fairing plastic and eventually snugs it up nicely. You can feel when it's correctly torqued by the fact that you can feel with your finger when the bolt tip starts coming through the end of the fastner. It took me some time to understand how that fastner would actually hold anything! The directions call for removing the fairing panels, but I decided I could do it without performing that extra work. 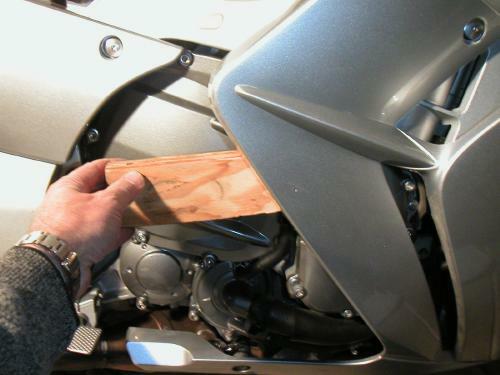 I had to use a small block of wood (shown a the photo above) behind the fairing when I drilled it, to make sure the bit didn't gouge the hard parts behind the fairing. 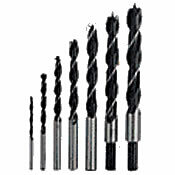 The drill bits bite into the plastic so quickly that they almost pull the drill out of your hand. 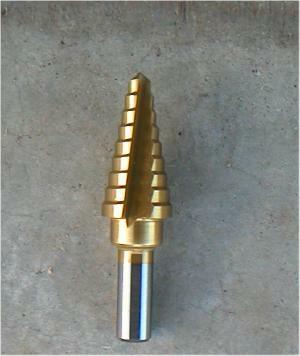 Take my advice, and buy or borrow a Uni-bit or a brad-point bit instead of using regular bits like I did. 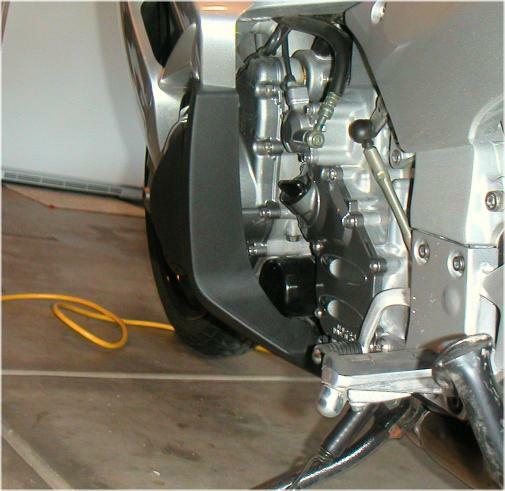 If you use a Uni-bit, remove the fairing panels, and put the bit in a drill press so you can control the depth. Accidently drilling a hole too large will seriously ruin things. The directions also call for using the stick-on decals to determine where the 4 holes need to be drilled in the fairing on each side. A friend who installed a pair of foot guards a week before I did informed me that the decals on the right side were incorrect, and using them would cause one to drill holes in the wrong spot. I took his advice and ignored the decals. I put a foot guard in place, made sure it was positioned correctly, then marked the top hole with a felt tipped pen. This is the first small hole I drilled, pointed to by the red arrow. Made me nervous to drill that pretty fairing panel, but it had to be done. Then I enlarged it, a little bit at a time. When I got it to 3/8", I put the rubber insert in the hole and attached the foot guard with just this one screw. I used that to hold the foot guard in alignment while I carefully marked the other holes with a black felt tipped pen. The left side, with all the 4 holes drilled, and the rubber inserts in place. The screws that come with the kit aren't like the neat allen-head fairing screws used elsewhere on the bike. 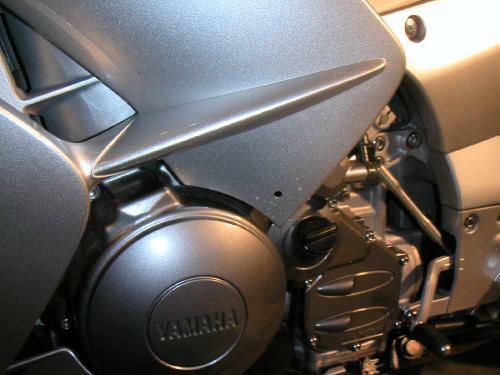 They are kinda cheap looking, IMHO, and I plan to try to obtain some of the nice chrome wide-head allen bolts that Yamaha uses on the rest of the fairing. 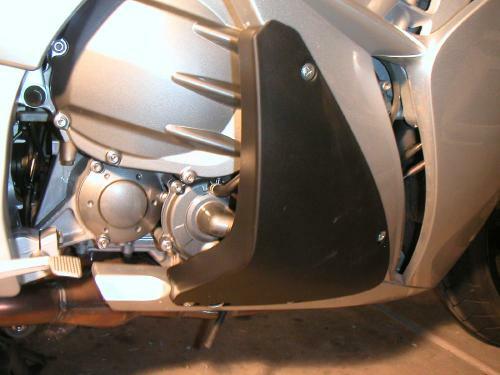 The left side, with foot guard mounted. The small vertical slit is so you can check the oil level, though you need a flashlight to do it, even in bright daylight. 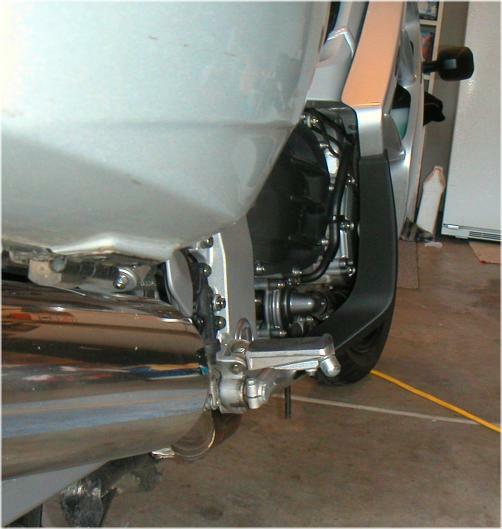 You have to remove the foot guard to change the oil, as it blocks the oil filter as you can see. The right side. These things really work! You will immediately notice there is no draft on your feet with them installed. I plan to take my foot guards off next summer, when the temps start to rise again -- but they sure are nice in the cool/wet weather. 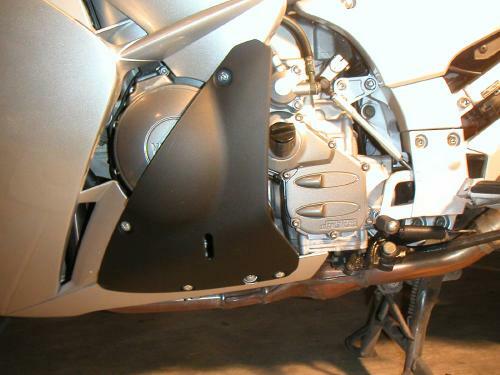 At that time, I'll probably leave the rubber inserts in place and just put the screws in them to hold them, rather than removing them completely and having the holes in the fairing showing. These two photos show how much extra protection the foot guards add.